We have had a crazy summer this year. My brother’s wedding, a vacation and many, many sleepovers at grandmas, just to name a few. My sister brought her five boys out for 6 weeks this summer, after not being together for just about four years, it was so much fun to be able to be together this summer. The not fun part? The two 30 hour drives that her family had to take to get here and back home again. 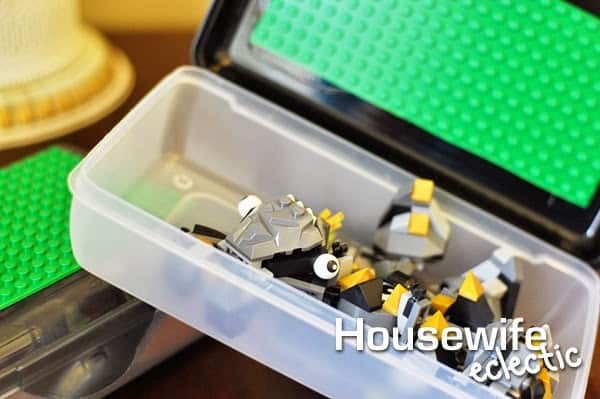 Road trips with kids can be exhausting, but these little Lego boxes are easy to whip up and provide hours of entertainment, without worrying about losing the pieces. Lego Base Plates found here. Measure the flat surface area of the pencil box. Cut your Lego plate to those dimensions. If you are making multiple boxes, make sure to check which way will give you the most pieces from one plate before you start cutting. In my experience, base plates cut with regular scissors, but if you are having trouble try using a utility knife. Hot glue the Lego piece to the top of the box. Repeat the process with the inside of the box. This gives them a place to build and a place to play with more freedom on top. When they are done playing, all of the pieces can be stored inside the box. What do you do to keep your kids busy on road trips? WOW< I LOVE this!! Perfect for my boys! What a brilliant idea! I love it. Now that's a pretty clever idea to bring along. I love coming up with things like this to surprise them. what great ideas! I like how everything is contained! Fantastic idea. My nephew loves Lego and he would love this. Thanks for sharing. My son loves legos! In fact we pay him to do his chores in lego sets! A traveling case like this would be perfect for him. Great post. I love your idea. My kids loves legos and this would be quite the product for them! Oh how awesome. I really need some of these for my daughter. Legos all over the car. Ok – this is brilliant! I am definitely making two of these for my boys. I LOVE this idea! I have those pencil boxes everywhere in our house. 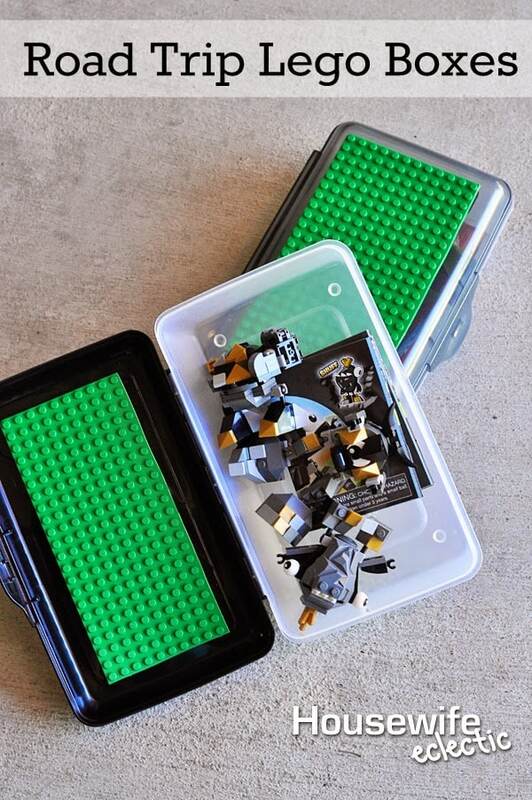 My boys are each getting one made for on the go Lego play. Thank you for sharing! This is a fabulous idea! I'll have to pick a few of the boxes up so the boys can have some mini-sets in the RV. This is such a great idea! I love it. That is a great thing to do with Legos. This is an awesome idea! I want to make 3 of these. How many plates do you think I would have to buy? Did the hot glue work? I was thinking something stronger?